Operators and pedestrians have been killed or seriously injured due to forklifts rolling when unattended. 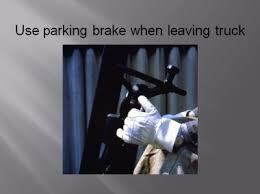 Operators must put the park brake on even when they are just getting off the forklift for a brief time. If you must park your forklift on an incline, the wheels should be chocked as well. How to safely park a forklift is part of our on site forklift operator training program.